I will definitely buy from John again. Buying my 2013 C6 Grand Sport from you was a pleasure! You made buying this car a very smooth transaction. I appreciate your professionalism and communication throughout the sales process, and with your assistance in shipping my Vette to Arizona. Also enjoyed meeting you and your tour of the surrounding area before taking me to the airport. If you are ever in Arizona, please let me know. 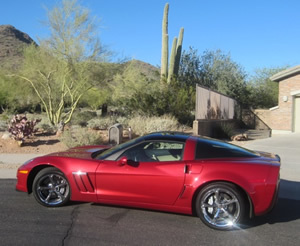 Barrett Jackson is a great event in January, and there’s no snow in Scottsdale. I just wanted to drop you a line to let you know how thrilled I am with the new 2009 Corvette Z06 I purchased from C and P Imports. Having come out of a highly modified head and cam C5 coupe I owned for the past 8 years, I am truly in awe of this new Z06. Being an avid Corvette and performance car enthusiast, owning the Z06 is truly a dream come true for me. It was so refreshing dealing with you and C and P Imports. Your enthusiasm for what you do really shows through in the care you take with your customers and the attention to detail you showed throughout the whole purchasing process. I purchased this car sight unseen given your customers high regards for C and P Imports and the level of confidence you gave me in the qualify of the car I was purchasing. You said I would not be disappointed and I was not. The car arrived on the enclosed transport at my front door in Virginia fully detailed and looking like new. It is really refreshing to receive compliments from family, friends, and folks on the street about my new Z06. Thanks again for a great purchase experience. You have a customer for life and I will be sure to refer all my friends. What can we say … by far the most relaxed, comforting, and pleasurable experience ever buying a car. It was a pleasure doing business with you. It’s not everyday that you shop for a vehicle, especially one that becomes a “Dream Car”, and become friends with the dealer. Can’t thank you enough for making this what every car dealership should model in the way of being courteous, respectful, and being fair when it comes to customer satisfaction. This is a beautiful car and we couldn’t be anymore satisfied. Continue treating customers with your excellent personality and your exact business process and anyone who has the pleasure of working with you will return when the need arises to purchase another vehicle. Given my health condition, the last thing I needed was the typical dealership to pressure me into something. You were terrific and I appreciate your patience in completing this deal. Terry and I wish you much continued success, and again thank you for making some hard times enjoyable. You went above and beyond with your professionalism, communication and working with my bank to get this deal done! I was initially leery of buying a car “sight unseen” and not having visited a brick and mortar dealership but after speaking with you and reviewing the testimonials of your prior client, you put my mind at ease. Also and more importantly, you made this process seamless and guided me through the process with your excellent communication and professionalism and had the vehicle delivered to my door. Thank you for everything and my family really loves the car and I will definitely look to you first for my next vehicle! 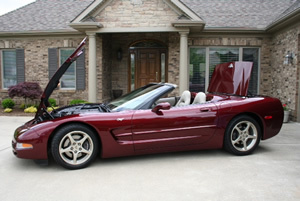 I’ve been looking for a 1993 Ruby Chevy Corvette Convertible for a long time now. Living in Seattle we don’t often see this sort of car very often for a number of reasons. I’ve been looking around for about 3 years now, and when I saw yours on-line I wanted to see it in person. I really felt that your unit could match my overly picky requirements. So I bought a ticket and went to Boston for a couple of days…John was nice enough to pick me up at my hotel and bring me to his showroom. When I saw the car for the first time in the showroom, it amazed me because it was even better than I could imagine. John was right-on when he described this car, and I was happy to learn that he’s even more picky than me! When I saw his other cars that he had in inventory, I couldn’t believe how pristine they all were. I’m sure I’ll buy another car from John and C & P Imports, and best of all, I won’t have to fly over to Boston from Seattle to see it in person because I trust John and how picky he is about which cars he sells. John is a rare find in this business, and would recommend him to anyone. 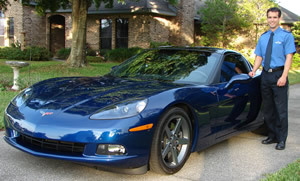 Buying a car, let alone a 2003 Anniversary Corvette on-line, was something I thought I would never do but dealing with you and C and P alleviated those fears completely. The car was everything you said it was and more. Thank you for your professionalism in helping to make this happen. I would recommend C and P to anyone wishing to make their car dreams come true. Thanks again John and continued success to you and C and P.
I just wanted to thank you both. It was a real pleasure dealing with you guys. Just after that one transaction talking to Dennis and meeting John has changed the way I feel about most people. You guys are honest and very trusting. People like you are hard to find now a days. 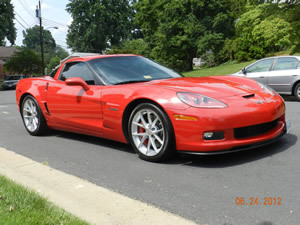 The transaction, selling my 08 Z06, went smoothly and exactly the way you said it would. I’m looking forward to doing business with you again. The word is out C and P Imports are the people to do business with. I’ll be in touch with you soon. Thanks again. Sorry it has taken me a couple of weeks to get back to you, but I’ve been super busy. Just wanted to let you and future customers know how pleased I am with the whole process of purchasing a vehicle from C and P Imports. Starting with several phone calls in response to your EBAY offering, the ” Handshake ” over the phone sealing the deal, the 1 hr flight from Baltimore to Boston, you picking me up, the 10 minute ride to your shop, the 45 minute orientation and document signing, leaving your lot at 9:30 am and a very exhilarating ride back to MD, it was without doubt the smoothest and most enjoyable purchase I’ve ever experienced. From start to finish your honesty and professional attitude made this whole thing work. Is the car what you said it was? NO it is much better. Everyone who has seen it, including Corvette folks, have commented it is a fabulous machine. Anyone who I know that might be looking for a similar car I’ll be steering them to C and P Imports. Thanks again John and best wishes for continued success. I was the resident skeptic when it comes to purchasing a vehicle on-line, particularly one from a non-franchised dealer that was a 15 hour drive from my home. John sensed my uneasiness and invited me to fly to Boston for a test drive, a review of their dealership and the opportunity to get to know him with assurances of “no pressure.” Boy, am I glad I accepted his invitation — I gained peace-of-mind that I was dealing with honest, legitimate car guys who are personally involved with each vehicle they sell. It’s easy to get ripped off buying a pre-owned vehicle unless you find someone who has the integrity and experience to conduct proper due diligence before they market a vehicle. After visiting C and P, I would buy from them again and refer friends and family without hesitation. 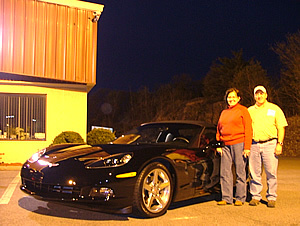 I wanted to thank you once again for working with me on the purchase of the 2006 triple black Corvette. I’ve had the car for two weeks now and it’s perfect. C&P clearly knows their business when it comes to high-end automobiles and has a trained eye for extra clean low mileage cars. Nobody’s as picky as me when it comes to critiquing a car. 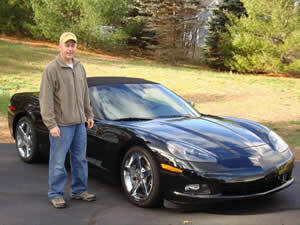 Your knowledge and experience with corvettes is better than any Chevrolet dealer I’ve worked with. The entire buying experience was upfront, professional and low pressure. I know where I’ll be going when I’m ready to make my next purchase. I want to say thank you for handling the sale of my 2009 Corvette Convertible with such professionalism. I have had a few Corvettes in the past, but not like this one. The color, the equipment and the pristine condition is what impressed me and especially the ease in which you both made it all happen. Keep up the great work. I know now for sure that C and P Imports lives up to their reputation! It was evident from the moment of our first conversation that C and P Imports takes pride in the way they conducts business, and in the cars they sell. It was a seamless transaction. When my car arrived, it was absolutely beautiful. The pictures did not do it justice. I had admired corvettes for the last 10 yrs or so always noticing them on the highway and saying to myself there goes my car or I would love to have that one. Although wishing, I never really believed it would happen, as something always seemed to get in the way. This year I decided that if I don’t buy one now, I might never do it as I am turning 57 and thought that waiting for the right time might never come. 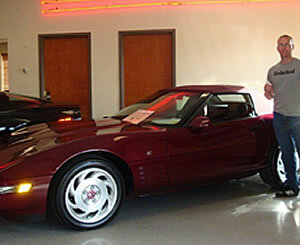 I looked at hundreds of ‘vettes on the internet and came across one that Dennis at C and P imports had. The car was beautiful and only had 2896 miles on it. I compared it to my favorite vette list and settled on it as the “one”. I called Dennis and asked if he still had it and he said yes. I asked him does it really look like that and he said absolutely, the car is perfect. We settled on the price, and I made arrangements to go to Boston and pick it up and with my wife drive it home. Dennis gave me advice, picked us up at the airport, and went out of his way to make our dream come true. Everything Dennis said about the car was honest and his dealings with us were also honest. He is a man of his word. If he tells you the condition the car is in you can believe him. He is a business man and needs to make a profit like any business, but he also does it fairly. 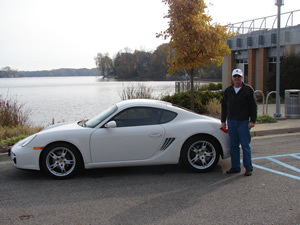 Even though he is a businessman, I believe he enjoys getting people the car they dream about as I don’t think anyone buys an exotic car to do business in, it is a dream they have had for a long time. 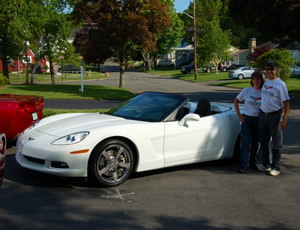 We drove the car home to Wyoming and saw 2500 miles of new country in our new Vette.